The quaintly named Pearland in the state of Texas sits in Brazoria County, and while you may think that the most famous thing about this city is the fruit from which it takes its name, there are actually a whole number of other great reasons to visit here. Pearland was established in 1894 and was actually better known for its figs than its pears, as early settlers flocked here and set up what is now a thriving city of over 100,000 residents. Pearland was given its name by a polish nobleman named Witold von Zychlinski, who saw the number of fruit trees in Pearland and decided that this would be a good name for the settlement, and nowadays you can even go on edible walking trails to sample some of the city’s famous fruit. As well as walking trails, there are outdoor activities galore here such as lakes, golf courses, and verdant areas of parkland, or if you prefer indoor pursuits then there are a range of sites of historical interest located in Pearland. 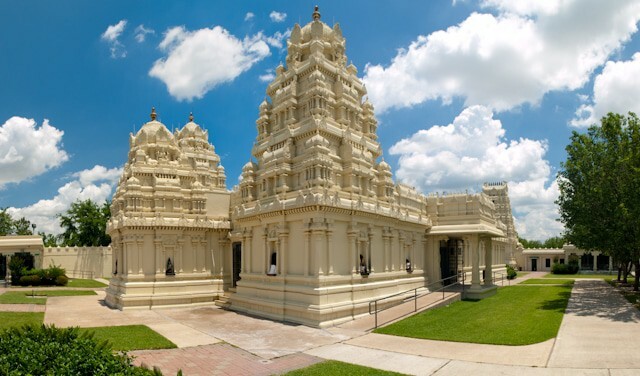 Built in 1979, the Sri Meenakshi Temple is a must-see activity in Pearland, and a quirky stop off in your trip around the city. The temple was first opened as a place for local residents to perform daily poojas, and it has all the traditional architectural features of a Hindu temple. These include a temple hall as well as the main Ganesh temple, living quarters for the onsite priests, and an ornate prakaram (the outer part of a Hindu temple sanctum). The temple complex has expanded over the years from 5 acres when it first opened to over 23 acres today, and aside from touring the temple, there is also a colorful and comprehensive visitor’s center where you can learn all about Hindu culture.